The French Bulldog (commonly called a Frenchie) makes a positively delightful companion for the family that can provide plenty of attention. 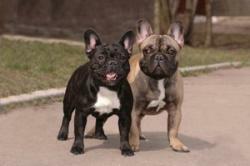 Is a Frenchie the right dog for your household? It's an interesting fact of this breed's history that the lovable Frenchie started out as a miniature version of the stalwart English Bulldog around the late 1800s. These dogs were bred down to a more companionable size, and along the way they caught the attention of a group of French dog breeders. Recognizing the mini Bulldog's wonderful attributes, the breeders quickly imported specimens they cross bred to French Terriers. This crossbreeding resulted in the modern French Bulldog. Sturdy and adorable are two words that immediately come to mind when looking at a Frenchie. The head is reminiscent of the Bulldog heritage and is fairly square in shape. The muzzle is very broad, but short like a Pug. The nose tilts slightly upward and the jaw is mildly undershot. A Frenchie's eyes are full, round and carry a very warm expression. The best specimens will show no white in eyes when looking directly forward. The ears are a very distinguishing characteristic of this breed. 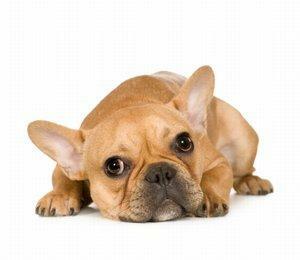 Unlike the English Bulldog, the French Bulldog's ears are erect like a bat's. They are broad, rounded and set at ten and two o'clock for a slightly angled appearance. The dog's neck is rather broad and short, and it tapers into shoulders that are broader than the rear quarter. The chest is also wide with good depth, but not as broad as the English Bulldog. The body is just short of rectangular and solid, with four strong legs that are generally straighter than the English dog's signature Chippendale front. The tail is little more than a stub. The average height of this breed runs about 12 inches at the shoulder. Balance and proportion are of great importance, but no specimen should weigh over 28 pounds. As cute as the French Bulldog is, it's the breed's personality that truly stands out. These dogs are lovable clowns that want to amuse and make over you. They were bred for companionship rather than performance. That's not to say they are without intelligence. They may seem difficult to train because of their silliness and headstrong behavior. You need patience and persistence when training a French Bulldog. Frenchies do not respond well to heavy handed tactics and shouting. Doing so will result in a very sulky pet that is longer listening to you. Clicker training is one approach that more owners are finding especially effective with this breed. This form of training builds on successes rather than punishing for failures. While not exactly a nuisance barker, these dogs can be quite vocal. They require a good deal of personal attention. Some dogs are prone to attaching themselves to a favorite person, so good socialization is a must. Begin with a basic puppy class and follow with a basic obedience course when the dog is old enough. The French Bulldog's short coat actually requires very little care. These dogs are medium shedders. Regular brushing is required to prevent loose hairs from collecting on clothing and furniture. A monthly bathing is usually sufficient. However, the folds of flesh around the face should be wiped clean on a daily basis to prevent musty buildup. This is easily accomplished with the use of a pet wipe. Special attention should also be paid to keeping the prominent eyes free of mucus and other debris. The ears should also be checked and cleaned periodically. Their upright setting promotes better than average air flow. Ear infections are not a common occurrence with this breed. The nails have a tendency to grow rather quickly. They should be trimmed or ground back two to three times a month. The eyes are prone to injury and infection. Obesity is an issue that usually leads to breathing problems. They can experience painful bouts of gas. This can be lessened with proper exercise. A substantial number of their litters must be delivered by C-section. They are prone to drowning when left unsupervised around open water due to their stout size.